The A1E1 Independent is a premium Rank I British heavy tank with a battle rating of 1.3 (AB/RB/SB). 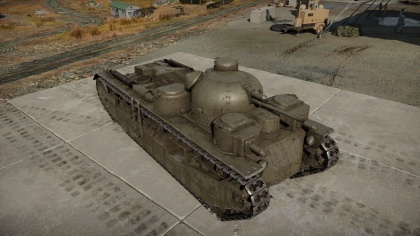 It was introduced in Update 1.63 "Desert Hunters". The A1E1, with its five turrets, serve as the instigator of the multi-turreted concept that spread to the Soviet T-35 and the German Neubaufahrzeug. Suspension wheels are 15 mm thick, tracks are 20 mm thick. Ammo racks of the A1E1 Independent. 47 mm gun is adequate. One available ammo type makes it easier to use for beginners. A rare sight. Many players will not know where the critical components are. 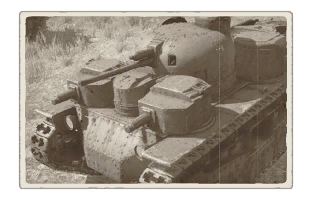 It has explosives in the AP rounds, very rare in British vehicles. Like other large tanks (eg T-35, T-28 and SMK) it is a very complex vehicle to kill. There are plenty of turrets, big tracks and curvy/angled parts to soak up rounds and 8 crew members to boot. 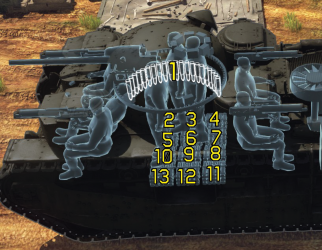 Very long tank, hard to hide side from flankers. Vulnerable to 20mm auto cannons. In many ways they are more effective than normal cannons due to their high rate of fire. APHE is inconsistent due to vehicles the Independent will be facing in general have less than 25 mm of armor. During the development and testing process, the Independent design was a item of espionage by the international community. Plans of the design ended up in the Soviet Union and in Germany, with a British officer named Norman Baillie-Stewart court-martialled for supplying secrets to the Germans, including the Independent plans. This espionage influenced several tank designs from these countries, with the T-28 and T-35 in the Soviet Union and the Neubaufahrzeug in Germany. The Independent was tested by War Office all the way until 1935, but it was a troublesome design. Most of the tests focused on its automotive performance, not even passing along to gunnery trials. The Independent was also used in a officer school for recommendations and examinations. The only model built, the prototype, was deemed worn out in 1935 as the War Office saw no need to spend more money on the design when other vehicles were being produced. They retired the Independent and sent the model to the Bovington Tank Museum, where it sits today for display. The Tank Museum. Tank Chats #24 A1E1 Independent. YouTube. YouTube, 05 Aug. 2016. Web. 21 Nov. 2016. This page was last edited on 8 February 2019, at 18:06.